Sometimes, I really think that men pay more attentions on personal impressions than women. I have ever read a report that the reason why men don’t love wearing shorts in summer is that they think their legs is not straight and beautiful enough. Maybe you are stunned at that. More than that, you also admire those who wear suits in summer. In order to show the satisfying impression they want and professional looks, they have sacrificed so much indeed. 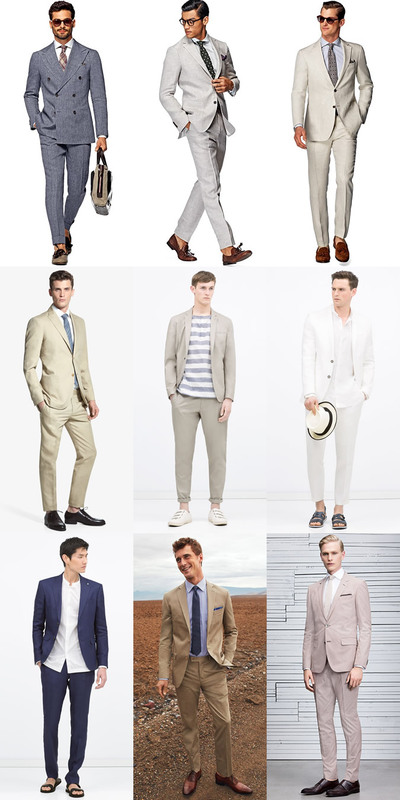 On one hand, it is really a great challenge for you to wear suits in summer. On the other hand, it is also common that there are so many white collars work in the comfortable condition under cool air-condition. Although there are less people to wear suits in summer, they can also bring more advantages to you, for example, professional impressions can be shown and unique dressing-up can be really attractive. I guess mens casual suits will be your better options. Men’s casual suits with light and thin material will be a more practical and favorable choice for you in summer, compared with formal suits. In the same time of showing you casual looks, it can also make you show elegant and gentle temperament, not lacking in the professional businessmen impression. I think that it can make you much cozier and more comfortable. Matching with casual t-shirts such as white t-shirts, striped shirts and collar shirts can really make you look great, filled with delicate and decent temperament. What you should pay attentions to is that shirts that you wear must have good quality enough, keeping you dry and cool all the time. It is certain that maintaining cool wearing of suits in summer is of great significance. Of course, there have another good way for you to make your suits look fresh. That is the color of suits. Light colors, particularly white and light blue, which makes you feel shivered in winter, will be your best choices.